In this podcast, I am talking to Dame Hazel Genn, QC. Among her many activities, she is a member of the Judicial Appointments Commission. In this interview she offers insight into how the JAC is changing the culture of how appointments to the judiciary are made. Acknowledging that the new approach is uncomfortable for some lawyers, she is confident that in the not too distant future its work will be accepted as leading to more openness in the process and more diversity in outcome. 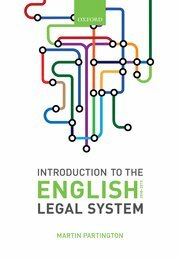 The Queen’s Speech – outlining the priorities of the new Government – does not contain much that relates directly to the issues considered in Introduction to the English Legal System. However, the economic constraints which are going to be imposed by the Government will clearly impact on the legal system. The resources available for the courts, legal aid, administrative justice etc will all be under considerable scrutiny. The pressure to do things more cheaply will be overwhelming. In the list of Bills announced: The Police Reform and Social Responsibility Bill may change the ways in which the police are organised; the Freedom (Great Repeal) Bill may impact on issues relating to criminal justice; the Parliamentary Reform Bill may lead to changes in parliamentary and election procedures. The Queen’s Speech also mentions other work that the Government intends to take forward, including House of Lords reform, and the funding of political parties.